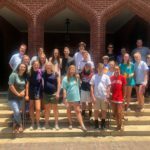 Welcome to Trinity Episcopal Church’s Youth Ministry page! Our Youth program is geared towards middle school and high school aged youth. We’re so excited that you’re checking us out! As the youth of Trinity Church, we strive to get out of our comfort zones, not only psychically and mentally, but also spiritually. We hope to spread the loving message of God’s Word through our faith in action. By becoming one with our peers, our church, and our community, we hope to enrich the lives of all we come into contact with. During the school year, we assist in teaching children’s Sunday School from 9:30-10:15am. On Sunday evenings we have our youth events from 5-7pm. The Confirmation process begins for youth 6th grade or above. This takes place in the Spring. This year, Confirmation will be on Sunday, April 14th, 2019 and classes will begin in March. If you have a youth who is interested in being Confirmed, feel free to contact me with any questions. Contact trinity.laurenb@gmail.com or call 706-322-5569 ext. 309. Click here to like and follow our Youth Facebook page, then be sure to head here to follow us on Instagram! These pages will give you weekly updates about what events are coming up and what takes place within our ministry. We’d love to hear from you and would love to answer any questions you may have!